Rose has a degree in biology and a passion for flowers. She and her husband, Courtney Hackney, began accumulating orchids in 1980. Over the years, their collection grew, and so did her infatuation with orchids. 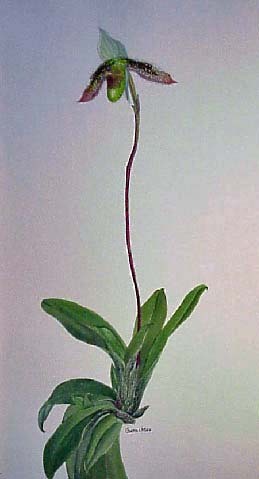 Both the thrill of watching a new seedling bloom for the first time, and her complete inability to grow any plant, led her to her desire to capture the beauty of orchids on paper. Choosing watercolor to start her painting journey some 20 years ago was a happy accident. Despite being the hardest media to master, watercolor allows an artist to apply multiple layers of different pigments in much the same way that nature lays down layers of pigments in plants and flowers. This unique characteristic allows an artist to capture the endless variations of color and markings that exist in the plant kingdom. Orchids in the Landscape: Through the years, Rose has experimented with many different approaches, which express the beauty of orchids and other plants. Some of her paintings employ backgrounds with bright colors that intensify the impact of the flowers, while others use the white paper as the background in the classic botanical format. 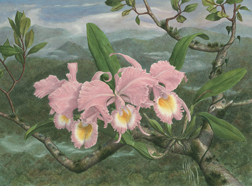 More recently, Rose has used the natural luminescence of the landscape as the background for her orchids. Although a time-consuming process, this approach allows each orchid to be expressed as an integral part of the natural world. After many years of painting in watercolor, she picked up her first pastel, and it was love at first sight. In pastel, Rose found the vehicle to paint pleine-aire landscapes; to capture the interplay of light and atmosphere at the point where earth, sky and water mingle in light and shadow. Rose has exhibited in several galleries, and juried and solo shows. *Ganucheau: Pronounced like "Can-you-show" with a "G". Rose is a cajun/creole from Southern Louisiana (Lafayette and New Orleans). She raised her family in Wilmington, NC. and currently resides in Jacksonville, FL.